It is hard to overstate the importance of pure, clean air. Asthma and seasonal allergies are on a dramatic rise throughout the world and the finger is being pointed to the poor air quality of cities and urban areas. With an increasing amount of the world's population moving into urban areas, clean and healthy air is a difficult commodity to come by. Fortunately, nature has devised a wonderful solution that does not require electricity or gas-powered air purifiers with expensive carbon filters. Plants are nature's own air purifiers; they breathe in carbon dioxide (CO2) through the pores of their leafs and, when combined with sunlight, release oxygen into the atmosphere. Some plants also absorb many more gases and chemicals from the atmosphere, ensuring that the air we breathe is pure and healthy. Research by NASA has uncovered which three indoor house plants are the only plants you will ever need to ensure that the air in your house is pure and pristine, dramatically improving the air quality, increasing the oxygen levels and removing harmful toxins from the air we so desperately need. As a bonus, they are also simple to grow indoors. Read more below to find out how to grow Areca Palm, Mother In Laws Tongue and the Pothos to achieve maximum benefits. If you are anything like me, most of your days are spent indoors. During the day, I spend 7.5 hours in a 40 year-old building whose windows have been bolted shut. Most of the air I breathe has been recycled, filtered and moved around from office cubicle to office cubicle since before I was born. It's no wonder then that after a few short hours of computer work my eyes are red and itchy, my throat is scratchy and my sinuses get infected far more than they ever have. By the time I get home, it's much the same story; in winter time, windows stay shut most of the day to keep the cold out and in the summer, fumes from the street and nearby highway make their way indoors, covering my house in a think layer of muck daily. Fortunately, entrepreneur and activist Kamal Meattle came up with a wonderful formula, based on NASA research, to "Grow your own clean air," which he presented in his 2009 TED talk (see link below to see the full TED talk, it is short and sweet). His idea was essentially to create sustainable working environments that would replace the need for expensive and energy intensive air purification systems with natural, energy efficient plants. Not only did his project save money, but it increased oxygen levels within the work environments, increased productivity and reduced maladies linked to poor air quality. You don't need to be a wealthy entrepreneur to have clean air, as we will see below, anyone can afford to bring these plants into their home and office to dramatically improve the quality of the air they breathe, a small gesture for both yourself and the environment. If you have ever dreamt of growing fresh air, the Areca Palm may hold the key to realizing your dreams. Indeed, according to research conducted by NASA, the Areca Palm scored highest in their study of indoor air purifying house plants. The Areca Palm is a lush, elegant green plant with feather-like fronds. In the event that you wish to never open window again (like for those times you feel like camping out in a bank vault), you should have 4, shoulder-height plants per person. This amount will provide you with all of your lifetime oxygen needs. However, for more moderate air purification, one large plant per room will suffice. Finally, it should be noted that this plant is considered moderate on the plant-care scale and may not be ideal for beginners. However, you can read more about how to care for this plant here. Never fear, however, if you have a hard time keeping plants alive, you are going to fall in love with the two listed below, they have been dubbed "unkillable," and for good reason too! Though it may have a biting common name, Mother-In-Law's Tongue is an ideal indoor air purifying and detoxifying plant. Indeed, it is one of the few indoor plants that actually oxygenates rooms during the night time, making it safe to keep in every room of the house, especially the bedroom. 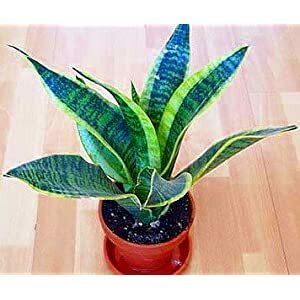 Mother in law's tongue, also commonly known as the Snake Plant, is an incredibly easy to grown plant of the succulent family, requiring very infrequent watering. This plant is ideal for beginners or brown thumbs as the only way you can kill this plant is if you drown it. Mother in Law tongues are also really affordable plants that have been known to grow up to 5 feet. As though that were not incentive enough, they are currently found in all of the most fashionable celebrity homes. The most trendy of the variations has a yellow or silvery green variegation on the outer part of the leaves, as seen in this picture. Aim for 5-6 of these, waist-high for optimal results. 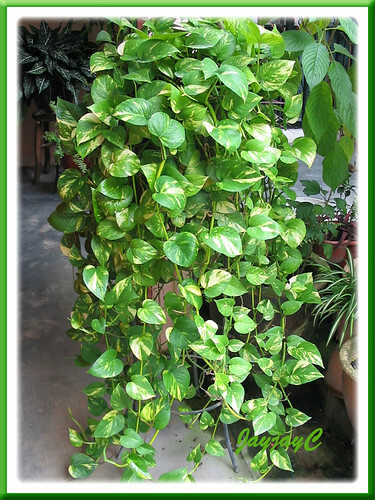 The Pothos is a true whiz when it comes to removing toxins from the air. In fact, no other house plant studied has the potential to remove as many Volatile Organic Compounds (chemical impurities that float in the air) than can the Pothos. The Pothos' waxy leaves absorb the chemicals from the air and filter them down to its root system that neutralizes the chemicals, leaving your air fresh and carcinogen-free. It has been shown to be particularly effective in eliminating such as harmful toxins as Benzene from petrochemical products, Formaldehyde from treated woods and tobacco-related smoke. While the pothos your mother or grandmother grew is just as effective at purifying the air, growers have developed stunning new forms with interesting variegations that give it a hip, updated feel. Plant it in an assortment of flowers to give it a lush cornucopia look, or give it a clever art-deco pot to really make it a trendy focal point to your home. Aim for approximately one of these lush plants per room for optimal air filtration. In case you have not yet made up your mind as to whether or not natural air purifiers are worth the investment, here's one last bit of information that you won't be able to ignore: Arecas, Mother in Law's Tongue and Pothos begin filtering the air from the very moment you bring them into your home. As though that weren't convincing enough, you will begin noticing a significant difference within days. What could be more perfect? An ecological solution to an urban problem, that (unlike machinery) improves its capacity to work as time goes by, can multiply and reproduce, providing you with more more plant to keep within your home or to give to loved ones and friends. And they look great too! One final note: though the recommended amounts listed below should keep your home oxygenated for a lifetime, use these plants in combination for maximum oxygenation and detoxification effect, as they each have their own purifying strengths. With this knowledge in hand, I encourage you to bring these wonderful plants into your home and into your office. Should you feel bolder, you could present these ideas to your bosses and have management consider changing their policies to include these plants in the office in sufficient numbers to filter your office building's old, stale air, too! We too often think about air conditioners as the ultimate solution and forget about Mother Nature with her billions of years of experience. Plants in out workplace are great for many reasons and clean air is probably most important of them. Thanks for the list of 'air-friendly' plants. I remember reading about beneficial plants for air quality years ago and for the life of me couldn't remember. I have the Epipremnum, just need to add Mother-In-Laws's Tongue and the Areca Palm and I'm good. My kids and I have allergies, these plants might help with symptoms. I imagine this info would be very useful for office spaces in cities, especially for buildings without opening windows. These are very easy plants to grow too. Also, I didn't know that the pothos was known as a money plant.